Having a home office can be pretty convenient, but there are a lot of annoyances as well. The following smart home office ideas will help cut down on distractions and automate your day. Best of all, the smart home devices 5 Easy and Affordable Smart Home Devices You Don't Want to Miss 5 Easy and Affordable Smart Home Devices You Don't Want to Miss These five smart home devices are easy to set up, easier to use, and can be purchased for under $100 -- the perfect solution for those new to the smart home world. Read More you need to accomplish these processes are very affordable. Using motion detection to turn on your lamps and your computer when you enter the office. Using motion detection to turn off lights when no one is in the office. Using the location of your family’s mobile phones to receive a “potential interruption” SMS notification whenever someone is arriving home. Controlling the TV or office lights right from your computer so you never have to break focus. Using voice commands with Google Assistant or Amazon Alexa to control any device in your office. If any one of those things sounds awesome to you, feel free to skip down to that section. If you want to see it all, then let’s get started. Note: Each of these processes assumes that you have already followed the installation instructions that come with each smart device, and have them connected to your home network. To accomplish this task, we’re going to make use of two smart home devices — a Wi-Fi camera The 5 Best Wireless Security Cameras for Your Home The 5 Best Wireless Security Cameras for Your Home Frustrated by wired home security systems? These completely wireless security cameras are just what you need to cut the cord. Read More with built-in motion detection, and a few smart plugs. All devices chosen for these projects are plug-and-play. In other words, no special smart home hub Should You Buy a Smart Hub Now or Wait a Few Years? Should You Buy a Smart Hub Now or Wait a Few Years? Read More , router, or special technical expertise is required. When you incorporate motion detection into your office automation, it lets you do very useful things like turn on your desk light when you arrive in your office, and turn it off when you leave. It also lets you control specific lights or devices depending where you are in your office. For example, you could have the Wi-Fi camera described in this setup pointed directly at your worktable stool, and have just the worktable lighting turn on automatically. Or switch on lights above a meeting table only when there are people actually sitting there. You’ll need the following items for this project. A Wi-Fi camera. A model with built-in motion detection is what’s used in this guide, but you can still get any Wi-Fi camera (including a smartphone you’ve set up as a Wi-Fi camera How to Build a Security Camera Network Out Of Old Smartphones How to Build a Security Camera Network Out Of Old Smartphones There's no better use of old smartphones than by building your own DIY network security camera system -- we show you everything you need to know! Read More ), to act on motion detection by using special software Log Your Home Activity With Google Sheets and USB Cameras Log Your Home Activity With Google Sheets and USB Cameras If you have a USB camera and a computer, you already have everything you need to set up an inexpensive motion detection system. Read More . A smart plug. Using a smart plug without a required hub is easiest, but it isn’t required. A lamp that plugs in to the wall: What makes the most sense in your office? This can be your desk lamp, or a floor lamp in the corner of your office. Or you can control both using multiple smart plugs. An IFTTT Account: Most of the automations described in this article use IFTTT The Ultimate IFTTT Guide: Use the Web's Most Powerful Tool Like a Pro The Ultimate IFTTT Guide: Use the Web's Most Powerful Tool Like a Pro If This Then That, also known as IFTTT is a free web-based service to get your apps and devices working together. Not sure how to build your applet? Follow along with this guide. Read More because it’s free and easy, but there are also other automation services like Zapier Create Awesome Life Automations with Multi-Step Zaps Create Awesome Life Automations with Multi-Step Zaps Zapier, the single largest competitor to IFTTT, announced that it now offers users the ability to create multiple action automations called multi-step zaps. Read More . In this article, I’ll be using the D-Link Wi-Fi camera, which doesn’t require a hub and has motion detection capabilities built in. I’ll also be using a WeMo smart plug, which is very affordable and takes less than 15 minutes to set up on your home Wi-Fi network right out of the box. That’s all the hardware you need to start automating your home office. The logic of this automation involves a person walking into your home office to trigger the motion detection and turn on the lights connected to your smart plugs. The automation needs to happen whenever there’s motion and should only turn the lights on, not off — otherwise you’d have your lights blinking every time you walk in and out of your office. First, you need to set up the hardware in your office. Set up your D-Link camera somewhere out of the way, but pointed directly at the door. Connect a smart plug to each device you want to turn on whenever you walk into your office. Using IFTTT for auomation can sometimes be hit and miss. Many wireless cameras out there will allow you to use camera actions (like motion or sound) to set an IFTTT trigger. In the case of D-Link, this doesn’t always work. You can check if it works for you by going through the following steps. Log into IFTTT, create a new Applet, search for D-Link, and choose the D-Link Connected Home Camera. Choose the Motion Detection trigger. If you notice the same issue I see here (where IFTTT can’t identify your camera name), you can instead use the D-Link camera’s built in notification option to set an IFTTT trigger. Log in to your myDlink account, select the camera, go into settings and scroll down to the Event Trigger Settings section. Click to enable motion detection. Scroll up to the Notifications section and select Enable e-mail notifications. Incoming notifications will have “Mail Alert: Motion Detected” in the body of the email. Now you can create an IFFF trigger for any incoming emails with that text in the body. You use the New email in inbox from search trigger. 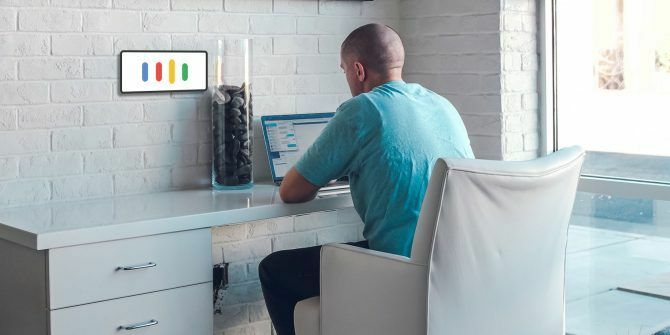 Whichever IFTTT approach you take to trigger off motion detection, you’re now ready to create the actions that will turn on your office gadgets plugged into the smart plugs. 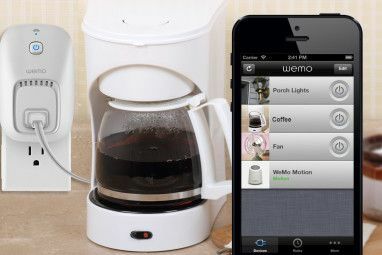 In IFTTT, just search for “wemo” and choose the “Turn On” action. There is an option to toggle your WeMo switch, and many people would assume that’s the best option. It isn’t. Remember that this action will happen every time there’s motion detected. If you toggle, it would work as expected if you’re the only person in the house. You’d walk in the office, and the lights would turn on. You’d leave, and they’d turn off. However if you walk in and they turn on, and then someone else walks in behind you, the lights would turn off. That’s not very useful. Just like automating your lights when you enter the room, it would be convenient to turn off the lights when you leave as well. For this automation, you’ll need a single Wi-Fi camera with motion detection capability. You’ll also need enough smart plugs for all of the lights in the office you want to control. Keep in mind that you can save some money: control multiple lights by plugging a power strip into the smart plug, and then plug all of the lights you want to turn on or off into that power strip. Since this automation is a little more advanced (you’re alerting on lack of a motion detection email within the last hour), you’ll need to sign up for a Zapier account. Zapier has the capability to trigger a new email any time a search for expected emails are not found. In this automation, you need to set up your Wi-Fi camera somewhere in the room where it can see all motion throughout the room. Using the camera software, make sure that the camera’s view includes as much of the office as possible. Once you’re satisfied that the camera is monitoring every area of the office, the next step is to set up motion detection emails. Do this by setting up the camera motion detection IFTTT trigger and email alert just like described in the first section of this article. Set up Zapier Schedule trigger. Search Gmail for motion alerts. Select Create Gmail Email if it doesn’t exist yet? Format the new email based on the lack of motion detection found. Make note of what you’ve typed in for the subject line. You’ll need it in the next few steps. Now, create a new IFTTT applet that is triggered when an email arrives when Zapier discovers no motion is found. This is where you’ll type in the exact subject of the incoming Zapier email. For the IFTTT action, set it up to turn off the WeMo smart plugs connected to all of the lights. Now, Zapier will check your inbox for any of the incoming notifications you’ve set up in the first automation in this article. If Zapier doesn’t find any motion detected in your office, it’ll send an email notification stating no motion was found within the last hour. This incoming email will trigger IFTTT to turn off all of your office lights. This automation will allow you to receive an SMS notification No Apps or Data Required: 5 Tools That Inform You Using Only SMS No Apps or Data Required: 5 Tools That Inform You Using Only SMS You've maybe forgotten that SMS exists, thanks to the many messenger apps. Text messages work without data, which can occasionally be life savers. These are the coolest tools for getting information over text. Read More whenever a family member has arrived home. The approach used in this automation uses the IFTTT Location service. You can add this to any iPhone or Android used in your family by installing the IFTTT app on the phone. There’s nothing worse than getting focused on a project or a task, only to be interrupted by someone walking into your office halfway through. But if you can receive an SMS warning before your family member arrives home, you can wrap up your thought process before they walk in the door. This is a fast and simple application. Since IFTTT can handle these alerts, and since everyone in your family likely owns a smartphone, there’s nothing additional to purchase. Once you add the IFTTT app to every phone in the family, you’re ready to set up this quick and easy automation. In IFTTT, create a new applet and choose location as the trigger. Select the location of your home on the map. For the action, choose Android SMS. Configure the app to send your phone the SMS message. Create an IFTTT account for every member of the family and set up the same Applet on their account. That’s all there is to it. The key element of being productive is staying focused on tasks Use the 80/20 Time Management Rule to Prioritize Your Tasks Use the 80/20 Time Management Rule to Prioritize Your Tasks How do you maximize your time? If you already prioritize, delegate, and still struggle to get everything done, you should try the 80/20 rule, also known as Pareto Principle. Read More . Every little action that takes your mind away from your work only contributes to procrastination Stop Procrastination in Its Tracks With 5 Proven Brain Rules Stop Procrastination in Its Tracks With 5 Proven Brain Rules Procrastination comes in all forms. Believe it or not, there are several principles in psychology research that can help you stop procrastination in its tracks! Read More and missed deadlines. This automation lets you quickly control lights, TVs and displays, or even a sound system. It uses the same approach as automated lights, but the trigger for this automation will come from your computer, rather than motion. A smart plug for each device (or a power strip connected to one smart plug). The Chrome Hash Button extension for IFTTT triggering from your desktop. 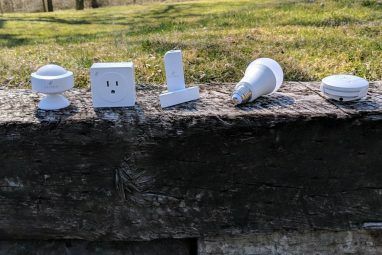 The only devices you’ll be using for this automation are smart plugs, so you can set them up just like described in the first automation in this article. Set up your smart plugs into your home Wi-Fi according the the manufacturer instructions, and plug in your lights, TV, entertainment system, or anything else you want to control from your computer. The Chrome Hash Button extension is the key element of this automation. It will allow you to trigger any applet in IFTTT just by clicking a button in your browser. In IFTTT, search for Webhooks, and on the Webhooks page, click on Settings. Make a note of the URL that’s provided there. Create a new applet, search for Webhooks and click on it, and then click on Receive a web request. Give it an appropriate name. On the action (That) part of the applet, choose the smart plug that you want to control from your computer. This time, you’re going to choose the toggle option. Next, click on the Hash icon in your Chrome browser (if you haven’t installed it yet, install it now). Click on I have key & Event Name. Then type in a unique name for the trigger, and paste the URL key you copied from above. Once you’re done, you’ll have a button in your browser that you can use to trigger the IFTTT applet. Now, all you have to do to turn on the WeMo switch that controls your lights, is click the Hash icon in your browser, and click the “lights_on” button. All you have to do to control your TV or your entertainment system is create a new button and link it to the smart switch that the device is plugged into. 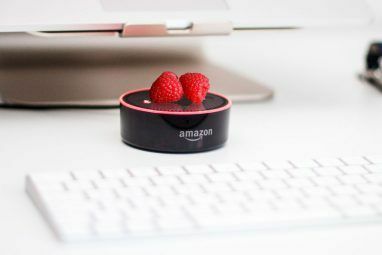 Controlling devices in your office using just your voice sounds like it would be one of the more complicated automations to pull off, but it’s actually one of the easiest. If you’re working on a computer, the odds are pretty good you need both hands to keep working. If you have Alexa or Google Assistant 9 Great Third-Party Amazon Alexa and Google Assistant Smart Speakers 9 Great Third-Party Amazon Alexa and Google Assistant Smart Speakers Looking for a Smart Speaker? There's no need to stick with the big brands, with the functionality, appearance, and price of these fantastic third-party smart speakers for Amazon Alexa and Google Assistant. Read More , you don’t even have to use your hands. Just say “Alexa” or “Hey Google” and you’re ready to launch your trigger command. Let’s take a look at how you’d turn on your office TV using just your voice. Google Assistant is free. Just install it on your phone if you don’t already have it. Before you get started, make sure to search for Google Assistant on IFTTT and connect it with your Google account. Once you do, you’re ready to create your first automation for TV voice control. Create a new applet, choose Google Assistant as the trigger, and choose Say a simple phrase. Describe what you want to say to trigger the office TV to turn on. For the action, select the WeMo smart switch, and choose the Turn on action. That’s all there is to it. To create a command so you can turn off the TV, just repeat the above process with the “turn off” command. The ideas described in the article above are just a few innovative ways to use automation to streamline your workday at home. A home office should be a place of productivity, and using these tips are sure to make your work more efficient. Have you developed any home office automations of your own? Share your own ideas and tips in the comments section below. Explore more about: Home Automation, Smart Plugs, Smart Sensor.